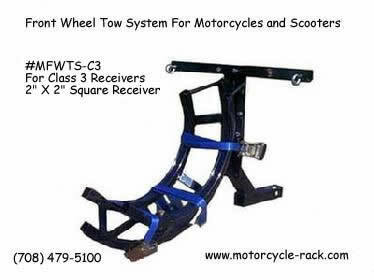 Hard to Find Tow systems for Motorcycles, Scooters, Trikes. and "Original Harley Davidson" Trikes! Free "Traffic Light Trigger" With Purchase of Long Distance Tow system! Click here for description: Just mention: Free Traffic light trigger in comments box when you purchase a FWTS. *Has swivel for towing Trikes! 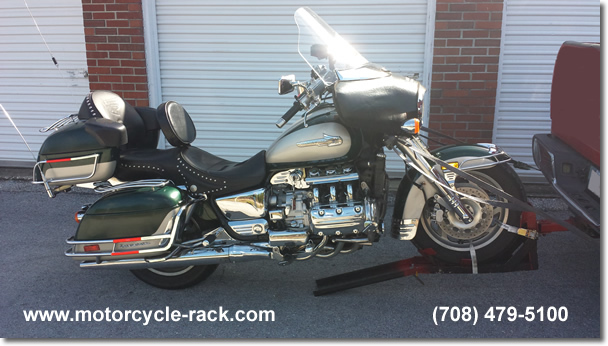 *See Picture Below, with "Honda Valkyrie"..
* Good for Harley Davidson Tri-Glide, Trikes or Honda Goldwing Trike Conversions. 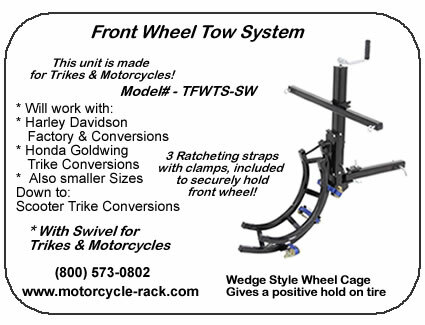 Motorcycle & Trike front wheel towing system! 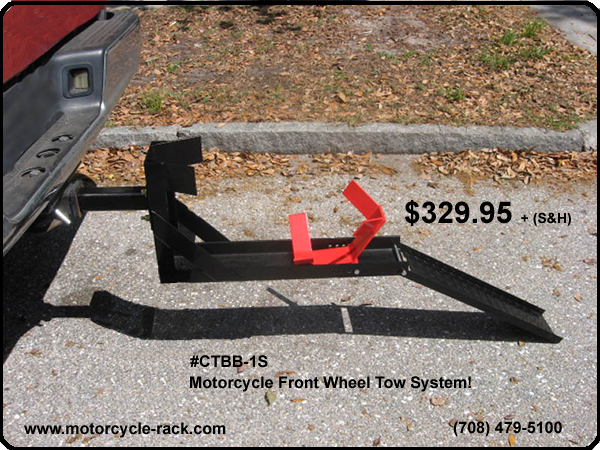 $329.95 + (S&H) "Back in stock"
* Has Swivel for Towing Trikes! * These are adjustable for your application and wheel size. and TRIKES and TOWS BETTER behind RV's and Campers! * Best choice for Harley Davidson and Honda Goldwings! 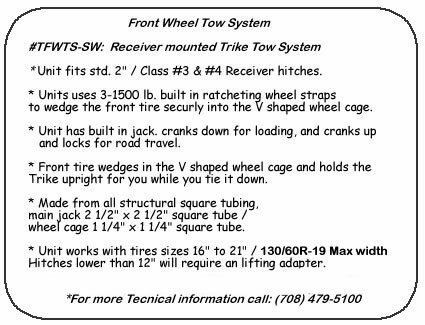 Trike & MotorcycleFront Wheel Towing System! * Lowers to the Ground for easy "One Person" loading! like on a Van and "Higher Receivers" on SUV's, Trucks & RVs. * New angled crossbar for more clearance! Class II hitches are weight carrying (WC) hitches rated up to 3500 lbs. gross trailer weight (GTW) with a maximum trailer tongue weight (TW) of 300 lbs. A Class II hitch usually has a 1-1/4" square receiver opening. * See Manufacturer's recommendations on towing, to see what is required for your motorcycle to tow the bike. 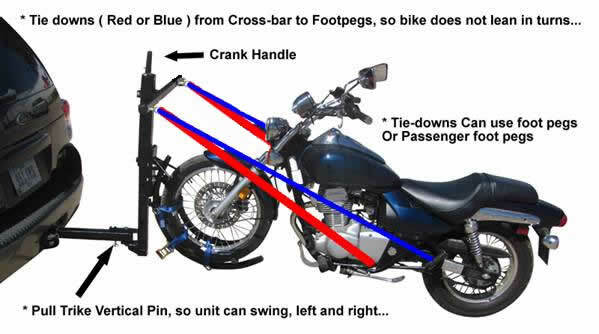 Motorcycle "Emergency" front wheel towing system! * Raise the motorcycle up, and insert the front wheel. Clamp the front tire using (2) ratchet straps. If you have a solid front wheel run the strap from axle to axle. Then use two straps to secure the bike to the Carrier. Crank the straps so they collapse the front tube (suspension) about half way. Make sure the bike is plumb. There will be some lean when turning. Every bike is different due to the rake angle of the front end. Place the bike in neutral and put the kickstand up. The bottom of the unit should be at least 10" off the ground for proper ground clearance. Motorcycle & Scooters "Long Distance" front wheel towing systems! 1. Do I need to remove my chain? We have had few problems with either shaft, chain or belt drive. * PLEASE check with your local dealer. Your dealer should have the last word on removing the chain, belt or drive shaft. then use "Zip-ties" / "Nylon Cable Ties" to hold the belt or chain up, out of the way. 2. Will it hurt my engine? tire and chain/belt. There is no torque on the trans so there is no heat generated. 1. Removed the chain, belt or drive shaft. 2. Used "Zip-Ties" / "Nylon Cable Ties" to hold the clutch lever pulled in, to disengage the clutch and prevent internal parts from moving. 3. Will my bike fit? small front wheel (*less than 16" ) it will not work. 3a. Will my TRIKE Fit? ~ The Trike unit will tow most trikes and conversions, scooter trike conversions all the way up to Harleys and Goldwings! *130/60R-19 Max front tire width. * Always check for longer custom exhaust, like "Fish Tails" for clearance problems. in some cases the exhaust, trailer hitch, or rear bumper may have to be removed for towing. * The Trike unit is adjustable up or down to work with different vehicle receiver heights. If you have a very small front wheel (scooter) it will not work. 4. What if I don't have a 2" receiver? At this time we offer a Motorcycle & Scooter unit for a 1.25"
5. Can I back up? Yes but the unit acts like a very small trailer and can jackknife very quickly. Always have a person stand in back, to the side to help direct you when backing up. looking down on the Trike or Motorcycle, to watch when backing up alone. 6. Can I tow my Super Bike? 7. Will towing my bike add miles to my bike? 8. How fast can you ship the unit? * Allow 7 to 14 days for delivery, depending on your location. 9. Will my rear tire wear out? The rear tire while it is on the ground it is only rolling. that there is no rider. There is also little wear due to the fact that the wheel is not accelerating or breaking your bike. 10. Do you accept Credit Cards ? but we do not ship till payment has cleared our bank. 11. I have a 1.25 receiver can I use an adaptor? changing the angle of the retaining straps. 12. Can I tow my bike using the rear wheel? 13. How do I strap the wheel down if it's solid? side of the axle. And tighten all. you will be using the towing system. 15. What stops the bike from going into gear while it is being towed? With the motor not running the synchronizers in the transmission would never line up. * Fits in your trunk, for easy storage and availability. * Always See the Manufacturer's recommendations on towing, to see what is required for your motorcycle to tow the bike. *Defective material replacement only. No Return Policy on these items. * See Manufacturer's recommendations on towing, to see what is required for your motorcycle to tow the bike. Removal of Rear Drive chain or drive shaft may be required, as directed by motorcycle manufacturer's recommendations. * Stock photos and illustrations may differ from actual product. General Use Directions: Your first few times have a helper assist you Park allowing room to load your cycle Prepare the tow dolly: insert the tow dolly into your trailer hitch receiver, install locking pin, * typical height of receiver is a GMC Suburban, Ford Explorer or Vans, do not use with receivers above your knee. Prepare/connect your ratchet straps to the widest points of the frame of your vehicle (leaving the opposite strap ends where you can reach them from your motorcycle)(do not use the hitch receiver chain loops since they are not located at the frames widest points), and attach a 2x6" ramp. push the cycle up the ramp and onto the dolly. Hopefully, you remembered to leave the straps within reach or are using a helper? Attach the handle bar 2-3" stabilizer straps snug, attach the wheel strap tightly, we recommend adding 2 more stabilizer straps. Ensure all are tight, remove the ramp. Place your motorcycle into neutral, turn your ignition off, do not lock steering, remove key. Consider removing chain/ belt (or partially remove and tie off with zip tie) (ask your dealer if this is necessary to remove the chain with your model). When possible make wide turns and avoid tight U turns as you would when pulling a short tongue small trailer. Frequently Asked Questions: 1. Do I need to remove the chain? Always tow with the cycle in neutral. When towing some models on the rear wheel and with the engine off, there is the chance the shaft and shift forks could run dry. So you may want to remove the chain. You can peel the chain away from the rear sprocket, and zip tie it to the side. This prevents you from having to pull the chain completely off. Others have been towing chain/shaft on by simply adding more oil to the crankcase. Once they reached their destination, they drain off the excess oil. In summary, it never hurts to remove the chain and it may be necessary to remove pending the brand of motorcycle. Please check with your dealer and use good judgment. 2. Will this wear out the tire? There is minimal wear on the rear tire since there is minimal weight (you and about half your bike's weight are not on the rear tire when towing) and there is no acceleration or braking from the bike's rear tire. 3. Are lights required? Most states do not require towing lights if your rear tail lights and signals are clearly visible-which should be the case. 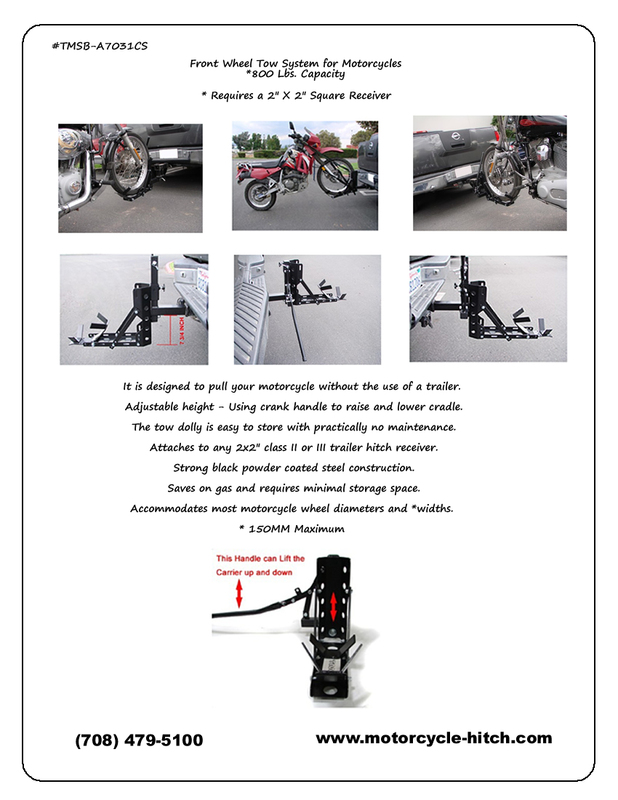 The Motorcycle Tow Dolly consist of a Solid Non-Hinged Tongue. If properly used, it is Federal CFR Title 49, Sec 393.70 compliant. However, please check with your states department of safety to ensure they are not required prior to using or add lights. 4. While towing will there be mileage registered on the odometer? The odometer should not add any miles when towing with the ignition off. 5. Will the straps bend the handlebars? Most cycle handle bars are designed to withstand several hundred pounds of pressure. The straps require 60-100 pounds of tension to keep the bike stable. And we recommend strapping near a T section of the handle bar to prevent the strap from slipping and to allow strapping at the handle bars stronger points. We also recommend using additional straps directly to the frame. 6. My truck is lifted, will this be a problem? The recommended height of your hitch / receiver is below your knee. 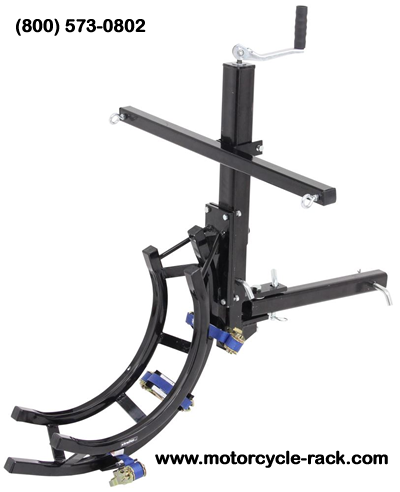 If your hitch receiver is higher, you may look into having a dropped receiver custom made at your local weld shop. 7. Will my honda accord pull my HD? Your car will pull the motorcycle easily with a Class 3, 2x2" receiver. Most cars also have several frame/unibody tow strap attachments under the car. Attach to the widest points possible to allow for more stability. 8. Will my bike lean when towing? The tow dolly is not hinged meaning the bike chassis castors behind the pulling vehicle. The steering head is the hinge point. As you make turns, the bike will naturally lean. However, as when pulling a trailer, avoid sharp turns or backing up. The same rules would apply when towing a short tongue small trailer. 9. What is the maximum weight capacity? The maximum weight capacity that rests onto the tow dolly is not to exceed 450 pounds. 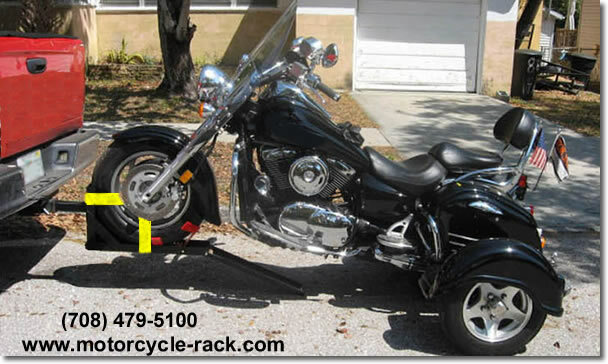 Most of the motorcycle's weight usually rests on the rear tire; however, you need to ensure the front tire's weight does not exceed the maximum load capacity of the tow dolly.